Where do the Browns go from here? The Browns are now 3-5 and their chances of winning any more games are small. They might steal a win from either the Jags or the Rams but the way they are playing there is no chance they can win any of their last 5 games. Even the trip to the Cards on week 15 seems like an impossible win. is a plan. The D has played fairly well despite being pushed around last week by the Texans. The big issues are on offense. The key issue is can the team win with Colt McCoy at QB? I think they have decided that the QB must be replaced. But this team is not likely to draft a QB in the first round. The problem is this—When you pick a 2nd or 3rd round QB you get a guy with a great arm that could not hit the state of Ohio from downtown Columbus or a guy with good to very good accuracy but no stronger arm than McCoy’s. Will either of those guys do the Browns any good? Probably not. The Browns have been the great arm 0 accuracy route with Anderson. They need to limit the playbook to the shotgun formations, go 2 TE 1 RB, and put Cribbs in motion as the flanker to help Colt get a better pre-snap read of the D. That will also allow him an additional half second to throw the ball. The WRs MUST run more accurate patterns and all plays that require the WR to stop and wait for the ball must be eliminated from the playbook. The West Coast Offense depends on hitting a moving WR with a short pass then generating additional yards after the catch. Sign RB Hillis with FB money. They MUST draft a RB high in 2012. They let FB Vickers go and so far FB Marecic is a big time bust. again. He catches the ball well and is an effective blocker. Promote RB Smith from the practice squad and start him. He is the only back with any speed. draw for big yards as well. Put WR Massaquoi on IR. He has suffered 3 concussive episodes in the last 2 games. He needs to go on IR to protect his health. I am not sure if he will ever be an effective WR but he must be healthy before the team can determine his long term ability to help the team. the ball in the few opportunities he has had. Mitchell is the only WR with great speed and size. He must get a shot because this team has no one that can stretch the D. They should check on getting one more vet WR from those available. Even WR Moss would help the team this year and help the evaluation of McCoy by providing a reliable guy that still has the speed to get deep and stretch the D. A vet would also help develop the younger guys. Say what you want about Moss. He has a work ethic that no one questions. the job of OC because he is comfortable with that function. He has failed to supervise the correction the pecial teams’ issues and the execution of the O has been abysmal. Holmgren has to do the parts of the HC job that Shurmur cannot or will not do. to prevent the entire franchise and his hopes for election to the HOF from going up in flames. round pick. At this point it is possible that QB might be Griffin (Baylor) or Cousins (Michigan St.). Both of these players have issues but would be a great improvement over the Browns current backup. no amount of draft choices can fill. Here is the problem with the draft only philosophy of the Browns. By the time that you finally have enough good picks to fill the holes you will lose the 2009 and 2010 picks because they will be tired of losing and hearing “rebuilding is a process.” If the team is not at least 8-8 by the end of 2012 it risks losing the fan base as well. 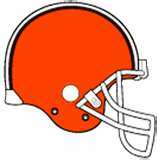 No team has been as inept and badly run over the last decade as the Browns. Even the Bengals have won the division and gone to the playoffs in the last 5 years. This fan base is dwindling because the team since its return in 1999 has been a disaster. full time job in sports talk in Northeast Ohio is the NFL Draft analyst. Because within 2 or 3 weeks of the beginning of the season the fans are wondering what we should do with our early draft pick the next year. The draft is the Browns fans’ Super Bowl because it is the only thing we have to look forward to. He is a senior writer for and edits https://fryingpansports.com. He has also published several novels on http://www.eBooks-Library.com/Contemporary/ and a non-fiction work at http://www.merriam-press.com/. or http://mooheadradio.com/2.0/. You can be part of the show by calling our Herbalife Hotline at 216-539-0607.